This command will save a static value to a data output. You can specify the value at design time, or as an Input Parameter value that will be set at run time. 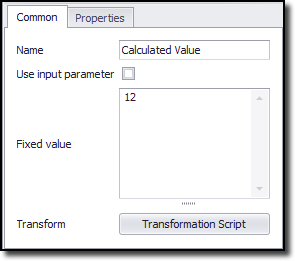 Click the Transformation Script button to enter regular .NET expressions or write a .NET script that will transform the value to meet your requirements. See the Content Transformation Script topic for more information about content transformation scripts.